Visit Our Store for More Great Items. CXRACING FMIC Intercooler Kit For. Intercooler + Piping + Silicon Hose + T-Clamp + Bracket. Intercooler is custom designed for Legacy, with Longer Core than common intercoolers, bolt on fit with mounting brackets, no cut. This is CXRacing's New FMIC kit Developed From Ground Up. With this Intercooler kit, Intake Temperature is lowered, and much better pulling capacity. Kit is designed with bolt on fitment comes with brackets for pipes and intercooler, Sensor flange is bolt on for Factory Temp-Sensor, also has Tube connects to factory bypass vales. Turbo Pipe is built with CNC matching Turbo Flange. Throttle Body Pipe welded with Flange to fit Stock BOV. 3 Cold Intake Pipe and Air filter shown on Pictures are NOT Included. Piping Kit: 2.5 Polished Aluminum Piping kit , w. Ith silicon hoses and T-Clamps. Core Size: 34 x 6.25 x 3 inch Overall Size: 26.5 x6.25 x 3 inch 2.5" Thick Core, 2.5" Inlet & Outlet. We do offer Black color , please check our listings. High Quality Mandrel bent Aluminum Pipes, Excellent Flow. Our New Products are developed in the US on our own race cars, fully Tested with fitment and Performance. All Race Cars Below Use CXRACING Products. We sell most of our products internationally. PR, Guam, VI , AK, APO , HI. 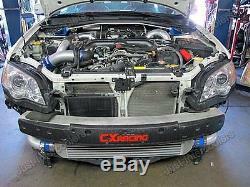 The item "CXRACING Front Mount FMIC Intercooler Kit 2005-2009 10+ Subaru Legacy 2.5T Turbo" is in sale since Wednesday, December 21, 2011. This item is in the category "eBay Motors\Parts & Accessories\Car & Truck Parts\Turbos, Nitrous, Superchargers\Turbo Chargers & Parts".